Learn to play the ukulele thanks to donations by Ben Hassenger and non-profit group Music is the Foundation. Library card holders who are 18 years of age or older may check out a ukulele pack. A valid DeWitt District Library card and a valid form of ID must be presented at the time of checkout. Borrowers must sign a Library of Things User Agreement acknowledging financial responsibility for lost or damaged equipment. The borrower's library account must be in good standing with a current address and fines below $10. The ukulele pack may only be checked out from and must be returned to the Library's Service Desk. The ukulele pack checks out for 14 days with the option for one renewal if there is no wait list. Don't have a Library card? Get an app here. Overdue fines for a ukulele pack accrues at $1.00 per day until returned. Library accounts will be charged $20 for a ukulele pack returned to a book drop (indoor or outdoor) or any part of the pack found unattended within the library. The ukulele pack should be kept in a temperature controlled environment; DO NOT leave the ukulele or any components in your car. The borrowing library user is responsible for costs associated with loss or damage of the ukulele and/or any peripherals. 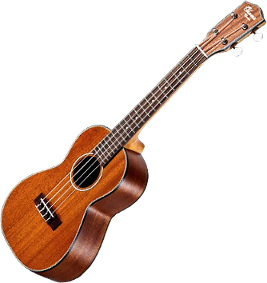 If the ukulele is lost or damaged, a fee will be charged to the borrowing user's library account. If the device is returned without any of the accompanying materials, the cost of each lost item will be charged to the borrowing user's library account. You will need to return the ukulele pack to the Library's service desk on or before the device's due date. A ukulele pack returned in the drop box will be subject to a $20 fee. You must return the device with all the original packaging and accessories. How do I renew the device? Just like any library item, if there aren't any other holds, you may renew it one time by logging into your account through the Library's website, the Library's mobile app, or by visiting the Library's Service Desk.